Eight mummies, colourful coffins and more than 1,000 funerary statues have been found at a tomb near the Valley of the Kings in Luxor in Egypt. The statues were traditionally placed alongside the dead to help them in the afterlife. The artefacts are thought to be at least 3,000 years old. The Valley of the Kings was the main place of burial for pharoahs and noblemen for nearly 500 years, until the 11th Century BC. The tomb was in the Draa Abul Nagaa necropolis nearby. It belonged to a nobleman who worked as a judge. "It was a surprise how much was being displayed inside" the tomb, Egypt's antiquities minister Khaled el-Enany told reporters. 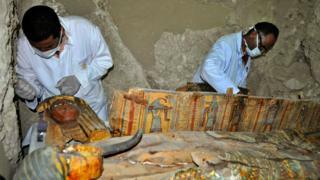 Spokeswoman Nevine el-Aref said there was "evidence and traces that new mummies could be discovered in the future". The coffins were well-preserved, painted in red, blue, black, green, and yellow. A statement released by the ministry said the tomb was T-shaped, with "an open court leading into a rectangular hall, a corridor and an inner chamber". The statues were found inside a nine-metre (30ft) shaft. Another room that was found has not been excavated yet.